Are you creative? Let’s work together. I wrote this letter three years ago, perhaps misunderstanding our student activist assignment to write letters of protest to oppressive regimes. Reading it now, my words seem so inadequate, especially given the recent news that Liu Xiaobo has died a prisoner of conscience. Did I even send it to the correct address? Likely, not. Was I mostly thinking of myself, my own woes, as I wrote it? Probably so, and struggling with how to reconcile my art with my activism. Reading it now feels a bit like a child’s school report. And yet, writing the letter changed me for the better. Rest in peace, Liu Xiaobo. (1955-2017). I am writing this letter to express my sadness and anger that you have been imprisoned, and also to extend a few humble words of support for your life and work as a poet. I’m sitting in a café in Greenwich Village with two fellow writers. We met here today to each write letters as part of PEN’s Defending Writers campaign. I can’t say that I’ve been an activist in my life. And yet, I have made a commitment to a life of poetry. In my mind, that is also a commitment to a life in search of the truth, and bringing that truth out into the light of day. These lines draw something new into my world. Reading them changes me in some fundamental way I cannot yet understand—the power of lies. To recognize a lie can mean intellectual freedom. It can change a person’s life and a country’s future. From New York, I send gratitude for your work and urgently call for your release from prison. I was very happy to be among the poets featured on WNYC radio for the National Poetry Month #NYcityverse challenge. You can listen to the 3-minute radio spot here. Portrait. 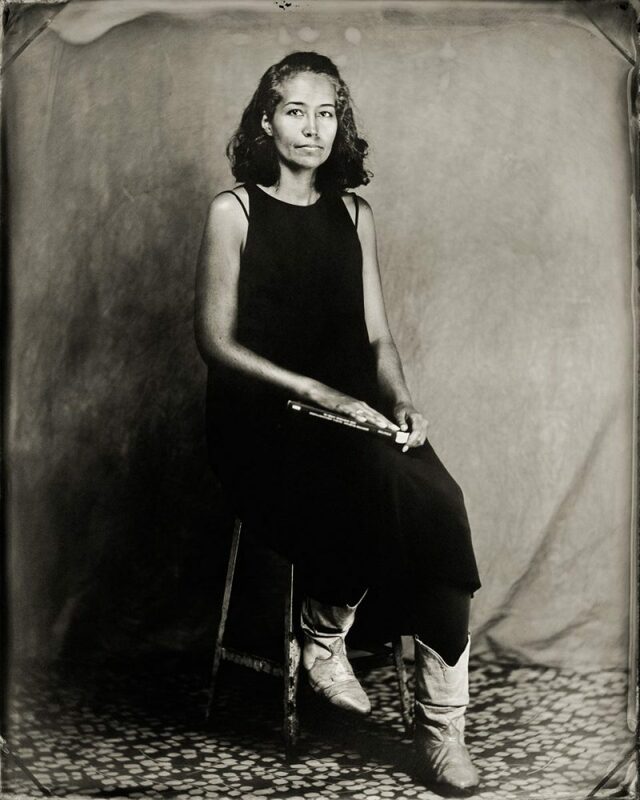 Shot by Jolene Lupo, Penumbra Tintype Studio. I am trying to remember that feeling of being completely present and alive. Moments of say, turning over a rock and staring at the worm, the roly-poly bug, and just being enthralled. I will admit that I ate junk cereal and watched a lot of cartoons. I loved the Smurfs. Yet like all kids, I had a rich inner life. Some kids are left to their own devices more so than others, and then the imagination flourishes in a kind of benign neglect, like coral reefs that flourished off the coast of Cuba. Read the full story, Go into Yourself: A Conversation with Safia Jama. I read a sign that said closed for the day. must be paid in arrears. and see the tops of a few trees. hotel bars & blaring TV’s. I know, I should have called ahead. Muftah Magazine’s Hiba Zayadin writes: “Safia’s poetic style is subtle in nature. There is an unexpected rawness to her otherwise gentle poems that lingers long after you’ve read the last verse.” I invite you to read the full story, which includes a Q & A and five new poems from my book-length manuscript. Blue whale swallowing the world. 24-hour hotline: Occasional no answer. We show our wares and want to be well-liked. This first-born, we place in your blue box. Walls made of war and Happy Birthday. Humanity, mashed up with a fork. This sad dog will not go out for walks. May his tears deepen the intensity of your blue frame.